Want to get away from it all? How's this sound: a sleigh ride through the woods, elk viewing, a gourmet meal cooked on a wood stove followed by a tasting of boutique wines? That's what's being offered by Michigan's Thunder Bay Resort and it is just what the doctor ordered. The resort is in Hillman, Michigan, about 20 miles from Alpena. We're not saying it's a remote location, but the resort includes the GPS coordinates just in case. You can enjoy winter's white blanket, proud evergreens and a horse-drawn sleigh ride as you travel through the Northern Woods. 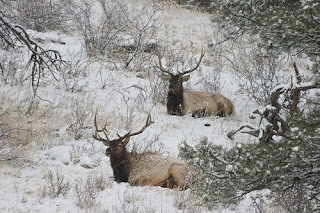 From the sleighs, you can view bull elk with world-class antlers. Later you can warm up in front of a split stone fireplace inside the Elk Antler Log Cabin as your gourmet feast is prepared on antique wood cook stoves. The meal will be accompanied by seven wines from Alpena winery Stoney Acres Winery. Stoney Acres Winery, a small boutique winery, was established in 1999 in Alpena, Michigan. The business began by providing equipment and ingredients for the home beer and wine maker while the signature wines were being carefully produced from fruit grown by local farms. In January 2003 the wines were introduced to the public in the tasting room located within the winery. Beginning with the Silver City Red (Merlot) and Silver City White (Riesling) in the grape variety and the Apple, Blueberry, Strawberry and Raspberry in the fruit varieties the wines were well received. The cost for the Elk Viewing-Gourmet packages begins at $234 per person for a double and a lower price is available for a quad. The package includes the elk viewing sleigh ride, gourmet dinner and wine tasting, two nights deluxe lodging, two full breakfasts in the Clubhouse Grill and winter activity passes including cross country skiing, snowmobiling and nearby ice fishing. (equipment rental extra). For additional information, call Thunder Bay at (800) 729-9375.